“What is a pineapple?”, “How do you use a diffuser?”and “Why are my curls so frizzy?” are all questions that go through your mind when you finally decide to let your natural hair be free. Yes, curly/natural hair can be a major headache to deal with. But once you find the right products that work for your hair, you will never want to straighten your hair again. Here are my favorite products for frizz free, bouncy curls! When people think about shampoo, a clay paste is not the image that pops into their head. However, Christophe Robin has produced a unique shampoo that gives volume while detoxifying the scalp from impurities. This was an absolutely crazy invention for me because I had never used a shampoo like this. I was scared that the clay would get stuck in my hair but to my surprise, this lathered up so beautifully cleansing my scalp and giving my hair weightless volume! The most important product in a curly haired girl’s life is conditioner. It is so essential to find a hydrating conditioner that allows you to detangle your hair without having major fallout. Maui Moisture’s Coconut Milk Conditioner does exactly just that. It is a creamy consistency that effortlessly allows me to work through my tangles without pulling on my hair too hard. Coconut milk, guava oil and mango butter all fuse together to nourish and hydrate dry hair. A leave-in conditioner is a must in my routine. Curls love moisture and the more hydrated you keep them, the less frizzy they will be. I’ve been using this leave-in for years and have repurchased it so many times because it doesn’t weigh my hair down at all and gives it the exact amount of hydration it needs. What is also really great about this product is all the natural ingredients such as coconut and apple extract that support healthy hair growth. This styling cream is a holy grail product for me. It gives curls the right hold and keeps them defined and frizz free. Argan oil can really help hair grow healthier and shinier and I believe that this cream nourishes hair while also keeping it defined and bouncy. This is another product that I have been repurchasing as soon as I’m about to run out because my hair would be a disaster otherwise. 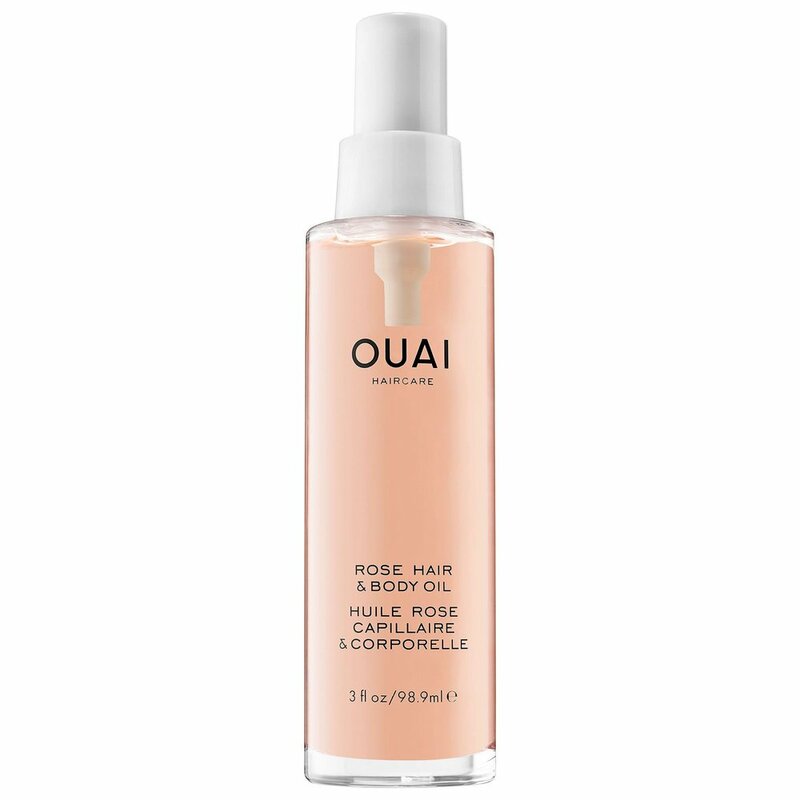 If you want a multi-purpose oil that smells extraordinary and has incredible ingredients, then Ouai’s Rose Hair & Body oil is the one for you. This product is packed with super ingredients including rose hip oil, shea oil and absinthium oil that nourish, protect and smooth hair. It can be quite heavy on hair (depending on hair type and length) so I recommend using one pump only for a perfect shiny finish!